After six days hiding in the US Embassy blind human rights activist and lawyer Chen Guangcheng has left the safety of his sanctuary. According to the Washington Post he left the embassy accompanied by the US Ambassador Gary Locke who had phoned the paper at 15:20 local time [07:20 GMT]. He was said to have been taken to a hospital in Beijing to receive medical treatment, though the exact details of his condition were not immediately known. The arrangement appeared to be the result of intense discussions between US diplomats and the Chinese government, which expressed intense displeasure over the incident as the state media broke its silence on the case. At a press conference Foreign Ministry spokesman Liu Weimin accused the US of "interfering in China's internal affairs, something which China will never accept." He also called for the US to apologise over the incident which has shone another unwanted spotlight on China as it reels from the fallout of the downfall of Bo Xilai and the murder of British businessman Neil Heywood. "The US Embassy is obliged to comply with international law & Chinese law," Liu Weimin said, adding that the US Embassy "should not engage in activities incompatible with its function". 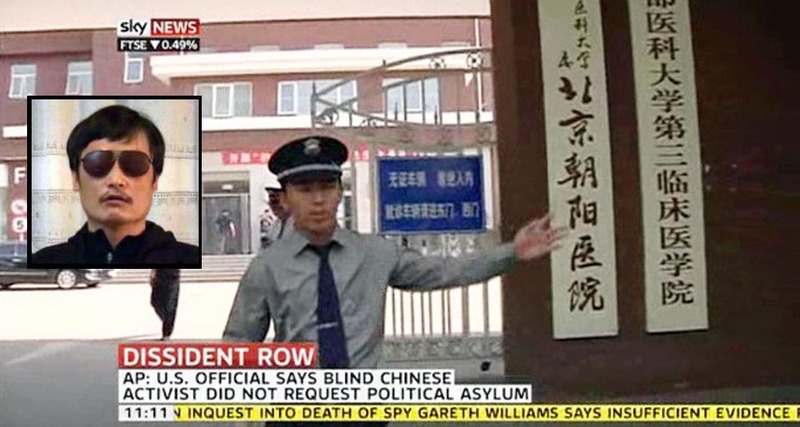 Police and officials were nonetheless still nervous, and foreign media were blocked from trying to film at the Chaoyang hospital where Chen Guangcheng was taken. As well as obtaining medical treatment, Chen is said to have been reunited with his family, though it is not known what his next move is. He may have been given assurances that house arrest would be lifted and that his stay in China would pose no risk to himself or his family. The fact that his family had joined him and that he remained under the protection of US diplomats indicated a possible deal whereby he might seek asylum in the US. However US officials said Chen would likely stay in China having been given "assurances" and had not asked for asylum in America. Locke's call to the Washington Post was the first acknowledgement that Chen had been sheltered under American diplomatic protection, a case that threatened to seriously upset Sino-US relations on the eve of a high-level, two-day dialogue led on the US side by Secretary of State Hillary Rodham Clinton and Treasury Secretary Timothy F. Geithner. What discussion had been held behind the scenes is unclear, but it seems that some sort of negotiation must have taken place given the timing of events. Chen left the embassy only hours before Clinton and the rest of the US delegation is due to step onto Chinese soil. Chen had been placed under house arrest in 2010 after spending more than four years in jail for disrupting traffic and damaging property. He had campaigned against forced late-term abortions and sterilisations carried out in Linyi city, Shandong province, as local officials enforced China's one-child policy. After six days in the US Embassy his future remains uncertain. It is not known how long he will stay at the hospital, although Li Jinsong, Chen's lawyer, said there was "no big problem with his health". Few people have been able to gain access to the famous patient. Uniformed, armed guards were stationed in the VIP ward and were keeping passers-by from entering one section according to Time magazine. By 17:15 local time, the guards became more aggressive, pushing out journalists who had gathered nearby.